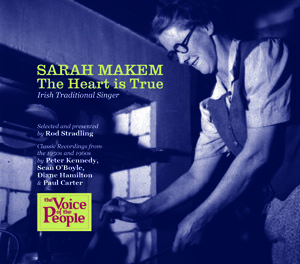 The first complete CD devoted to the influential Northern Irish Traditional singer Sarah Makem. The Heart Is True is selected and presented by Rod Stradling from classic recordings made in the 1950s and 1960s. Drawn from recordings made during the 1950s and 60s these four volumes capture the music making of working people. This is the home-spun art and entertainment that enriched the lives of working people in pubs and cottages, in social clubs and village halls and on the street, and was made â€œby people with dirt under their finger nails.â€ This is music that has been largely ignored by the vagaries of the commercial recording industry. The emphasis in the presentation of this series has been weighted towards the social lives and values of the performers. Series Editor Reg Hall has chosen individual experts to select and compile these four volumes â€“ Shirley Collins, Steve Roud and Rod Stradling. 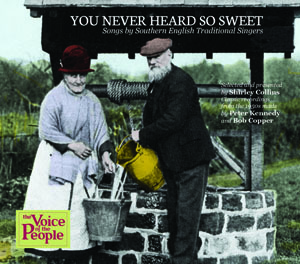 TSCD671 YOU NEVER HEARD SO SWEET : Songs by Southern English Traditional Singers. 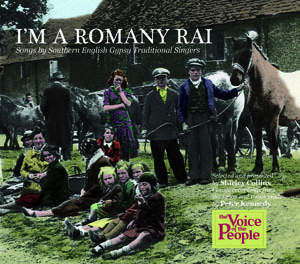 TSCD672D I’M A ROMANY RAI : Songs by Southern English Gypsy Traditional Singers. 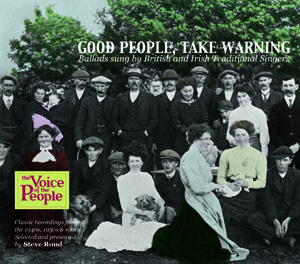 TSCD673TÂ GOOD PEOPLE, TAKE WARNING : Ballads by British and Irish Traditional Singers. A collection of songs by Southern English Traditional singers. You Never Heard So Sweet is selected and presented by Shirley Collins from classic field recordings made in the 1950s by Peter Kennedy and Bob Copper. Series Editor – Reg Hall. A two CD set of songs by Southern English Gypsy Traditional singers. I’m A Romany Rai is selected and presented by Shirley Collins from classic field recordings made in the 1950s by Peter Kennedy. Series Editor â€“ Reg Hall. Amongst he 59 historic recordings on these two discs are powerful recordings of many of the finest Southern English Gypsy traditional singers including Tom Willett, Phoebe Smith, Charlie Scamp, Sheila Smith and Rebecca Penfold. The second CD is entirely devoted to recordings of Carolyne Hughes and her family. 3. Janet Penfold: Wonâ€™t You Buy My Sweet Blooming Lavender? 5. Charlie Scamp: How Old Are You, My Pretty Fair Maid? A three CD collection of Ballads sung by British and Irish Traditional Singers. Good People, Take Warning is presented and selected by the noted folklorist Steve Roud from classic recordings made in the 1940s, 1950s and 1960s. The emphasis in the presentation of the Voice Of The People series has been weighted towards the social lives and values of the performers. This volume, however, focuses on the history and meaning of the songs. It wasnâ€™t thought necessary by field collectors in the 1950s to enquire very deeply into the family and social background of the singers they were recording, with the consequence that they very often documented only with thumbnail sketches.